It came with a Cable. I have WORKING FT-5 R1 with the old original 4 line LCD. I LOVE IT and have printed tons of stuff over the last 2 yrs. Please Where do I look for a HOW TO install this LCD ? I am willing to DL the latest Marlin for MKS 1.4 and make whatever editing changes are necessary. I am also willing to DL the latest MKS TFT firmware IF necessary and place that on an SD card for FW upgrade. I just need some assurances and pointers as I don't want to KILL my 2 yr old, working machine. SKIP TO POST 8 - 8 for a happy ending ! to use the mks 28 and printed from USB stick. So I WILL try it as soon as I get a clear chance to dig into the back of my machine. I'll report back here One way or another. I still do NOT KNOW if I can "SAVE" my current Marlin SW before Messing with it. PS sheez I feel like I'm talking to myself here !?!?!? The MKS TFTs just talk simple gcode to the controller, no firmware changes on the controller are necessary. Make sure you have the baud rate set correctly and as Chris said, it should just work. I tried it out as Chris suggested this AM and ... Hey Presto ! it works. Find that simple and concise info was beyond me - thanks go to Chris. 1. The cable provided (not by Folger tech) is too short. The Machine has some new quirks on Start up of a print. try to rediscover it and then flash the new code to the TFT. regardless, Thanx for comments and encouragement. Oh, and yes the cable they provide with the TFT is about 6" too short, so you must fabricate a longer one. I have the MKS 3.2TFT on my FT5 R1, but I also run a Smoothieboard so I probably can't help you all that much from the Marlin/MKS1.4 end. The best way I know of to save an image of the firmware you have is to use a programming pod such as an AVRISPmkII with Atmel AVRStudio. That will allow you to save an exact bit for bit clone of it to disk, including the EEPROM data. And you can use the pod to write it back without losses if you need to. Adruino (at least the version I have) doesn't seem to have the ability to download an image from a board, only to upload to it. At least that way you can easily locate and reverse whatever you did if you decide you don't like it. I can confirm that the MKS TFT outputs serial GCODE data, so all you really need is a port on the Marlin that can accept a serial input and be sure that the baud rates match on both ends as @csorrows said. The default rate for the TFT firmware configuration is 250k baud though and the selections are limited (see below). I felt this to be a bit high for the length of the ribbon cable, so I run mine at 115,200 and have had no issues. I have had the 3.2TFT for a while now and love it. Having a color display is nice, and I have customized it with my own graphics and commands. It can be a bit frustrating to work with at first though (particularly if you are trying to change the graphics). It handles SDHC cards better than the 2004 and 12864 displays did and can also handle USB sticks which of course they can't. One thing I don't like about it is that there is no direct "kill" button. It can be added via header pins in the back, but otherwise you have to go through a couple of touch steps to stop something in progress. And because it outputs a GCODE kill function it may take a moment to take effect. Other than that, I feel that it is a good and worthwhile upgrade. Very kind of you to assist in my TFT quest. Thanx also for good Programming practices. It's always too easy to take short cuts. I actually HAVE some ATMEL programming equipment left over from the late 1990's ! I was trying to automate a Drill press with a stepper on the quill and an rotary indexing feed feed table. I WILL try to grab that Image, PRESUMING that the code has not been LOCKED from reading ! I believe that I have discovered the reason for the HOT BED TOUR I described above. shown below. I have COMMENTED OUT the cfg_ZADD. Only experimentation will prove true or not. It shouldn't be locked from reading if you uploaded it through Marlin. If it was pre-programmed as supplied from FT (or whoever) it is anyone's guess. But because one of the gripes I had with FT from the very start was that they did not provide the card programmed despite claiming that it was in the build manual your chances of being able to download the contents are pretty good. I have not had particularly good luck with either mesh bed leveling or with Zadd actually. I have stiffened up the Z axis motion and platform a lot, installed a very repeatable Z stop sensor and changed to a three point manual leveler point setup. 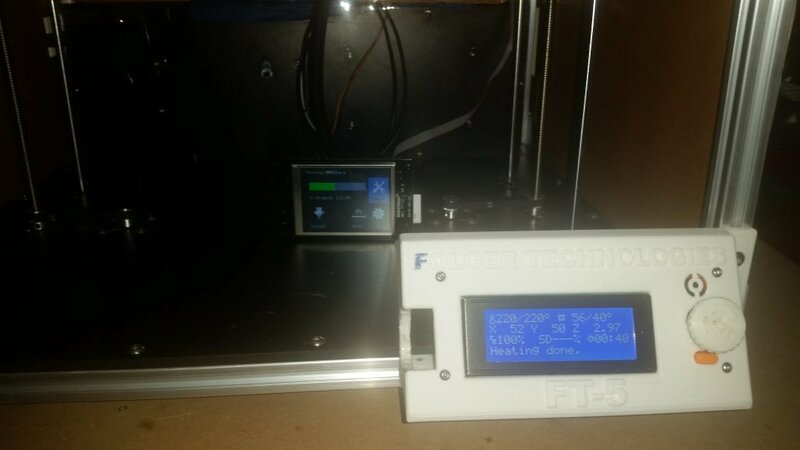 That combination works well enough that bed or mesh leveling seems unnecessary, at least for my printer, and I may yet remove it from my TFT's menus to free up space for something else. Glad you found a new cable. I happened to have some raw ribbon cable laying around so I pried off the connectors on the one supplied with the TFT and clamped them onto the new cable. I also added some clamp-on ferrites to both ends, but that was more of a "belt and suspenders" thing and probably wasn't actually necessary at the more conservative baud rate I am running. I go way back with Atmel parts as you apparently do. I was quite disappointed when Microchip bought them because I have never warmed up to the PIC parts or programming environment. But as long as they continue to produce the AVR parts and AVRStudio continues to work with them I am a happy camper and remain a loyal customer. One of these days I will get around to CNC automating my mill, but that firmly remains a "someday" project at this point in time. Boy, I really appreciate you're hanging in there with my silly problem. Agreed with your assessments on ATMEL. I have not been paying much attention to what happened to ATMEL since retired. it went into a sub dir and DID NOT reconfig on 1st power up. However is WAS properly displaying. So I moved those files UP one dir on the SD card and repowered it. the whole display is now REVERSED ! for gawds sake ! I am now searching for the correct Config.txt command to reverse things before I do another REBOOT. OoooK FOUND IT in github !!! I Copied the Github rar I expanded the rar onto my SD card, where everything went into a sub dir. I finally pulled the bin file up to the root level. Power down , reconnect the TFT with the "fresh" SD installed and Power up ! ALSO I am running the new additional TFT in parallel with the original LCD . Note I could not show final installation as I am waiting for new longer cable. to accommodate the new TFT32_L v4.0 differences.. I hope this journey helps anyone else attempting to try this upgrade. Thanx to Ron for assistance. "#The screen is flipped 180°(0x00: no flip, 0xEE: flip)"
Set the value to 0xEE and the displayed information will be rotated 180 degrees (with the USB and SD sockets to the left).